Dale Farm Home » Is Eggs Eggs? I have just returned from a few days in Liguria where I have eaten some glorious pasta, superlative anchovies and the worst scrambled eggs ever. Pale, hard, tasteless and stringy you could not have guessed they were even remotely related to the creamy, soft bright yellow, eggiest scrambled eggs that we serve at Dale Farm. Here the Eggmeister (Paul) shares his secrets. By the time you have taken them through to the guest the eggs will be perfect. Poached eggs. The secret of a good poached egg is very simple…extremely fresh eggs. Everything else is smoke and mirrors. Fried eggs. You might think you can’t go wrong with a fried egg but there is a lot of personal preference involved even within our own family; this is the reason why the Americans have so many names for fried eggs, sunny side up, over easy etc. 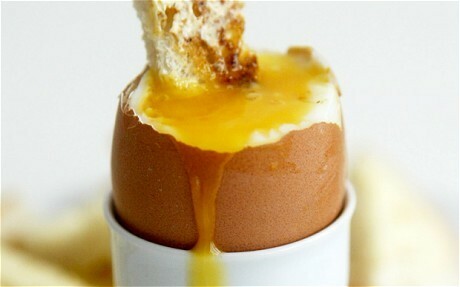 Paul likes a slow cooked egg so that the white is purely white, the yolk extremely runny and flicked with fat. The kids like a fast fry causing some crispiness to the white. I like my egg flipped as I can’t bear any softness in the white and don’t like the yolk too runny. Jack the dog will eat them anyway you like but particularly likes a raw egg, shell and all. Boiled eggs. We don’t offer boiled eggs unless specifically asked and Paul doesn’t really enjoy cooking them as you can’t see what’s happening. In the early days a lady asked for a 2.5 minute boiled egg for her toddler. We knew it would be raw but the family was Malaysian so we thought maybe that’s how they eat them in Malaysia. The egg came back 3 times before it was cooked enough for the baby and we wondered whether Mum had ever actually boiled an egg. So really that phrase ‘eggs is eggs’ couldn’t be further from the truth. Hope you enjoy your eggs at Dale Farm.